Marilyn Moss is a freelance writer. Her most recent book, Bill Moss: Fabric Artist & Designer (www.billmosstents.com), was published in 2013, won a 2014 IPPY Independent Publishers Silver Medal and was a finalist in nonfiction for a Maine Writers and Publishers Alliance Literary Award. "Will Someone Please Find My Poulet? ", The New Guard, Vol. 5, Fall 2016, has been nominated for a Pushcart Prize. The article, “Tents: Nomadic Architecture,” was published in Espazio in February, 2014. 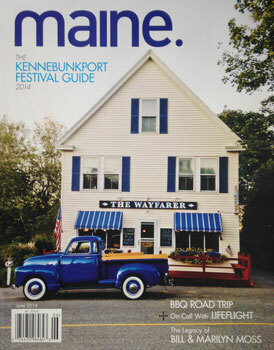 “Home as a Tent” was featured in the August 2014 issue of Maine Boats, Homes & Harbors. Marilyn is completing her memoir, From the Appalacchian Mountains to the Camden Hills. In 2009, she traveled to Malawi to interview Joyce Banda, the country’s former president, and later coauthored the article "Dancing with Democracy: Understanding Malawi’s First Female President,” that was published in the Spring 2013 issue of Orbis, the Foreign Policy Institute’s journal. The essay “Along the Shore” was published in the Fall 2008 issue of the Louisville Record. Marilyn received her MFA in writing from Spalding University in Louisville, Kentucky in 2009. Widely recognized as a successful and socially responsible business leader, Marilyn, who cofounded Moss Tent Works with Bill Moss in 1975, served as president and CEO of Moss Inc until she sold the company in 2001. In 2000, Moss Inc won the Maine Businesses for Sustainability’s Eagle Feather Award, the group’s highest honor. She has also received numerous personal awards, including the Maine Women’s Lobby’s Award for Economic Development, the University of Southern Maine’s Distinguished Achievement Award, and Maine Initiatives’ Watering Can Award for being “a philanthropist with a social mission.” While president of Moss Inc., Marilyn was recognized by New Hope for Women for establishing supportive workplace policies for domestic violence victims.